Creates a scrollbar gadget in the current GadgetList. Minimum, Maximum The range of values that the scrollbar can take. These values should be between 0 and 10,000 to avoid limitations on some operating systems. PageLength The amount of values that are part of the current displayed "page". For example you can have a picture which is 100 pixels width and you only see 25 pixels. What you see is a called a 'page', in this example, the page length will be 25, the Minimum will be 0 and the Maximum will be 100. 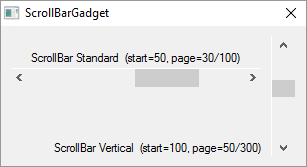 #PB_ScrollBar_Vertical : The scrollbar is vertical (instead of horizontal, which is the default). - GetGadgetState(): Returns the current slider position (value between 'Minimum' and 'Maximum - PageLength + 1' range). - SetGadgetState(): Changes the current slider position. #PB_ScrollBar_Minimum   : Returns the minimum scroll position. #PB_ScrollBar_Maximum   : Returns the maximum scroll position. #PB_ScrollBar_PageLength: Returns the PageLength value. #PB_ScrollBar_Minimum   : Changes the minimum scroll position. #PB_ScrollBar_Maximum   : Changes the maximum scroll position. #PB_ScrollBar_PageLength: Changes the PageLength value. An event is triggered when it's used. See examples below.